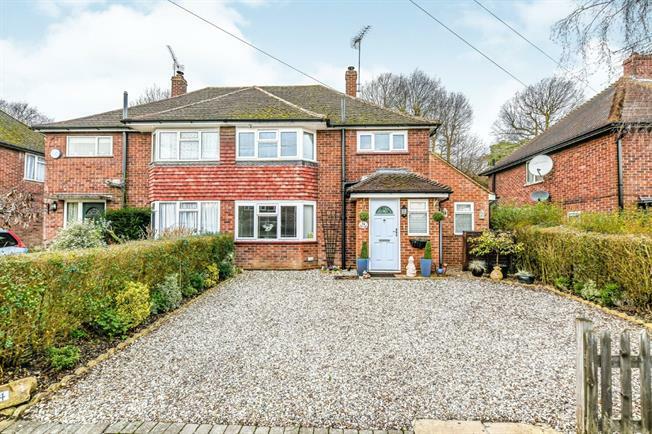 3 Bedroom Semi Detached House For Sale in Bagshot for Asking Price £399,950. A spacious very well presented three double bedroom semi detached family home situated in a sought after location, close to local amenities in Bagshot. Accommodation downstairs comprises entrance hall, lounge with log burning stove, dining room, refitted contemporary kitchen with granite work surfaces, conservatory, utility room and shower room. Upstairs are three double bedrooms and a refitted family bathroom. Outside to the front is a driveway providing off street parking for several vehicles, the rear garden is a real feature of the property, beautifully maintained by the vendors it is fully enclosed with a patio leading to an area of lawn with mature planted borders, specimen trees and plants.